Thick fur that provides insulation against cold water while swimming. Upperbody dark brown to reddish-brown. Underbody pale brown to silvery-cream. Native to eastern mainland Australia, Tasmania, and King Island. Introduced to western Kangaroo Island. No rigorous estimates. Considered common within its range. Possibly numbers in the thousands or tens of thousands. Use powerful forelimbs for swimming and burrowing. Rear limbs act as rudders while swimming. Mainly nocturnal. Rest in burrow during the day. Forage at night. Sometimes active during the day. Solitary outside of breeding season. Mainly bottom-dwelling insects (especially larvae). Also, shrimp, crayfish, and swimming insects. Other occasional prey. Not well known. Red fox, domestic and feral dogs, cats, Tasmanian devil, raptors (e.g., wedge-tailed eagle). Infrequently, crocodiles and large native fish. Possibly goannas and snakes. Physical maturity reached at two years of age. Many individuals begin breeding later. Thick fur provides exceptional insulation against cold water (better than that for polar bears and beavers); thick fur makes platypuses prone to heat stress when out of the water. How to cite: Platypus (Ornithorhynchus anatinus) Fact Sheet. c2018. San Diego (CA): San Diego Zoo Global; [accessed YYYY Mmm dd]. http://ielc.libguides.com/sdzg/factsheets/ platypus. Thank you to Josh Griffiths for providing expert content review of this fact sheet. Senior Wildlife Ecologist Josh Griffiths leads cesar australia’s platypus ecology research team, including field studies to monitor platypus abundance, distribution, and population recovery, as well as ecological genetics. He is also deeply involved in cesar australia’s community engagement initiatives, such as platypusSPOT, a citizen science project. Mr. Griffiths has extensive experience studying platypuses in the wild, including conducting field surveys of platypus abundance and health. He also works with government representatives, industry leaders, and community members to develop management plans and conservation programs related to the platypus. Mr. Griffiths has worked in diverse landscapes in arid South Australia, the highlands of Victoria, and Tasmania’s river systems. Mr. Griffiths earned his bachelor’s degree in Environmental Biology the University of Adelaide. See his detailed profile on cesar australia’s website. Thank you to Dr. Jessica Thomas for providing expert content review of the Managed Care section of this fact sheet. Senior Keeper Dr. Jess Thomas oversees the platypus husbandry program at Healesville Sanctuary, a world-renowned facility in platypus breeding, care, and research. In 2018, Dr. Thomas earned a PhD from the University of Melbourne, where she studied platypus breeding behavior. She also investigated maternal care and juvenile dispersal in the platypus. 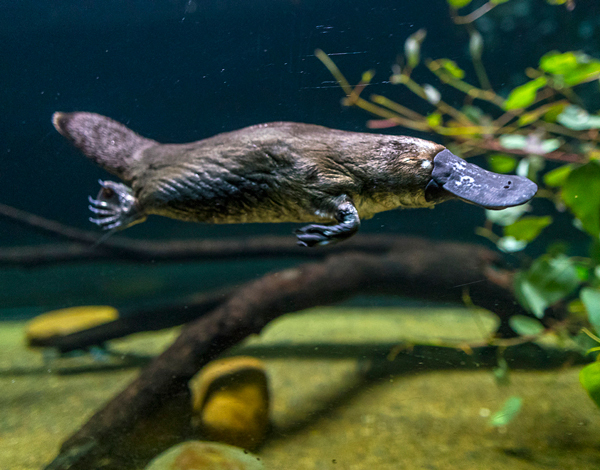 As a keeper, Dr. Thomas oversees Healesville’s platypus managed care programs, including behavior, diet, nutrition, health, and exhibit environment. She has conducted research on behavioral enrichment for platypuses to enhance animal welfare in zoos. Dr. Thomas is the platypus studbook keeper as well as a species coordinator for the Zoo Aquarium Association. Thank you to Dr. Thomas H. Rich, Curator of Vertebrate Palaeontology at Museums Victoria, for reviewing the Evolutionary History section (in Taxonomy & History) of this fact sheet. Dr. Rich has extensive research experience with extinct monotremes and other extinct mammals. See his Museums Victoria curriculum vitae and publications list to learn more.